The Central Coast AVA is a massive coastal appellation in California that spans from San Francisco to Santa Barbara and encompasses many smaller AVAs. The Central Coast appellation is strongly influenced by the Pacific Ocean, with high winds, dry days and ocean fogs to create a cool, but very long, growing season. While white varietals once dominated the vineyards in this region, red varietals are emerging as winemakers realize tåhe opportunities the Central Coast provides. Found in the center of Monterey County's Salinas Valley, Arroyo Seco offers ideal conditions for producing white wines full of tropical fruit and refreshing acidity. The larger eastern and central areas of Arroyo Seco are dominated by Chardonnay and Riesling, where mixed soils of gravelly and sandy loam, a warm midday sun and cool afternoon winds add complexity to the wines. The smaller western section of the AVA is a gorge cutting into the Santa Lucia Mountains, protected from cool Pacific winds and allowing Zinfandel to thrive in the warmer conditions. Hames Valley, found at the southern end of the Salinas Valley in the foothills of the Santa Lucia Range, has warmer than average temperatures that are associated with the Central Coast, offering good growing conditions for Bordeaux varietals. Dominated by Cabernet Sauvignon and Merlot, the shale-loam soils of the valley impart intense flavors, outstanding balance and brilliant colors the wines. Monterey County is located within the Central Coast AVA and benefits from the Pacific Ocean's morning fog and cool winds. This cool climate influence creates one of the world's longest growing seasons and is ideal for grape varietals that benefit from a longer hang time. 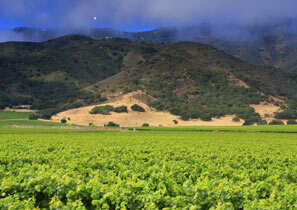 Monterey County is home to seven smaller AVAs: Arroyo Seco, Carmel Valley, Chalone, Hames Valley, Monterey, San Lucas and Santa Lucia Highlands. Situated high above the Salinas Valley within Monterey County, the Santa Lucia Highlands AVA has developed a reputation for producing wines with intense fruit character. 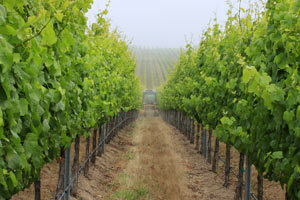 Chardonnay dominates the vineyards, although Pinot Noir is quickly establishing itself as another favorite. Running parallel with the Pacific Ocean, this region benefits from well-drained granitic soils and is sheltered from harsh weather by the Santa Lucia Mountains. Cool morning fog and afternoon breezes are drawn into the Salinas Valley from Monterey Bay, creating a very long growing season.